The majority of amateur golfers are looking for the secret golf stretch to improve their shoulder turn or rotation on their backswing. Are you one of them? Can you make a full, 90 degree shoulder turn with minimal tension? Or, do you struggle to get their and feel bound up trying to make it happen? If so, there is hope. I don’t think there is a secret golf stretch to improve your shoulder turn, but I do know there are many golf stretches that can greatly improve this situation for you. The bottom line is core rotational flexibility. The act of getting your core, chest and shoulders to rotate maximally to a full and somewhat tension-free shoulder turn. The focus should be on your core. This means doing as many golf exercises and stretches as you can to improve not only the range of motion, but also the strength for optimal clubhead speed and distance. Look at the picture I’ve inserted here. I’m in a lunge position rotating into my backswing swing with a club. The is not only a great stretch for your backswing shoulder turn, but for your hip flexors as well. This is one simple golf stretch that if done consistently will make a big difference in your body’s ability to rotate and improve your shoulder turn. About The Author: Mike Pedersen is one of the top golf performance experts in the country. He is Golf Magazines Golf Performance Expert, as well as GolfIllustrated.com's expert. 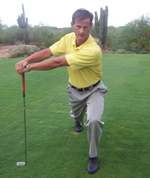 Mike has a golf stretching dvd out that will quickly improve your golf swing.